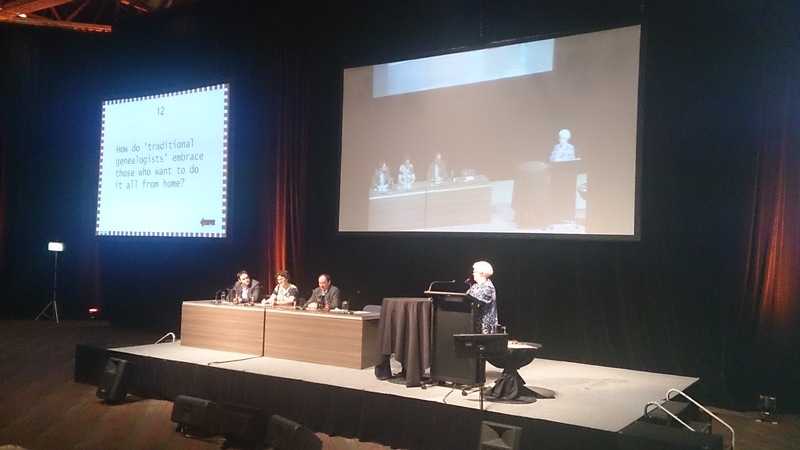 The final session of Congress 2015 was a Panel discussion entitled Family History Research: why leave home to do it. The panel members were Josh Taylor (FGS and FMP, USA), Carole Riley (SAG) and David Holman (FFHO, UK) and it was moderated by Congress 2015 Official Blogger Jill Ball aka GeniAus. Jill had a list of questions which were decided by a number nomination from someone in the audience. The number determined which slide came in which order. A tricky way of keeping things lively. Since there’s no proceedings paper with a focus on societies I thought it might be helpful to present the summary as I typed it up throughout…feel free to correct me if I got something wrong. I may not be able to resist having my threepence worth on a couple of the items too. Thanks Jill for the change of pace and generating interesting discussions. Thanks also for the use of your slides to check the question titles. 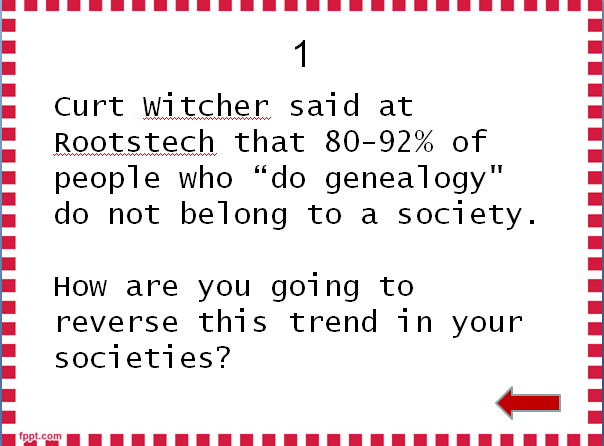 Curt Witcher said at Rootstech that 80-92% of people who “do genealogy” do not belong to a society. How are you going to reverse this trend in your societies? Josh: Your society needs to know what’s going on…need to be on FB, Twitter or you don’t know what’s going on. FGS (US equivalent of AFFHO) is going to other groups as well. Younger demographic may not like “society” because the term is old-fashioned. Use different term? Try different approach? David: someone with local knowledge; get with the program of newer strategies, about doing things not just putting out data. My thought since coming home: is the term “genealogy” too dated? Would family history capture people’s imaginations more? The quality of online advice from well-meaning (and inexpert) people on message boards and Facebook groups is sometimes dubious. What can society members do to combat this? When there is inexpert advice on Facebook (FB)…put your head above parapet and clarify. 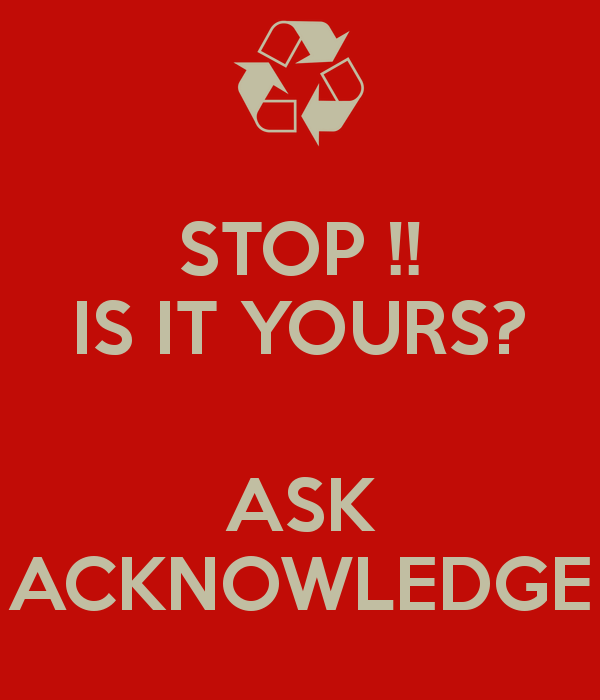 In Australia societies are not taking advantage of nationwide promotional activities eg National Family History Month. Do they exist overseas? Josh: NFHM (USA) is October; some societies are really good, some have seminars. Suggests researching which politician is relevant in terms of funding and get them to promote it by researching their family. Jill: Shauna said all you have to is relabel your August activities as NFHM and let it be known widely. How do traditional genies embrace those who want to do it all from home? Josh: great that you can do it at home, but there are also extra documents offline (in another talk Josh mentioned only 15% are online). HAGSOC librarian: collaborate with other society libraries. Online genies may be unaware of copyright regulations and the niceties of sharing. How can we educate them in ethical behaviour? David: legislation varies across nations; may even need legal advice; there are some unethical,people, however some don’t know/understand the basics. Up to FH society to educate them. Carole: Australian Copyright Council has booklets, talks etc. Buy and share them in our FH libraries. Random Acts of Genealogical Kindness: RAOGKs can make it unnecessary to travel to a repository or visit a society. Online genies can barter with others to make visits, do lookups, take photos etc. What impact do these activities have on societies? 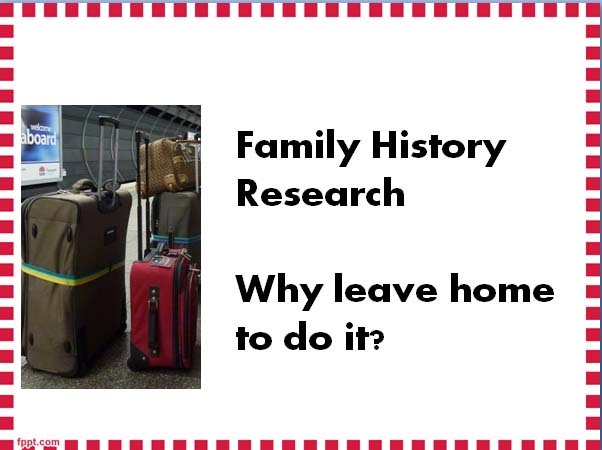 Do family history shows on TV help or hurt the concept that everything can be done at home? How can we promote the joy of holding original documents in our hands with those who do all their research online? Josh: hard to convey – impact of dust in archive; video and emotion to see it. David: archives don’t want you holding original docs. 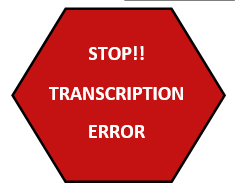 Many resources found online are transcriptions. What is the danger in relying on these? Is social media friend or foe to Family History Societies? David: FFHO – employed someone to change social media from being foe to friend. What can you get from a society that you cannot get ‘online‘? Are societies providing and promoting whatever this is? Carole: indexes, transcriptions, experienced members and knowledge, gravestone images/transcriptions from before they were faded through time and weathering. My question: does the society have any form of online information to tell potential members what unique indexes etc they hold for their region and others. How do researchers find out what local databases, indexes and files are held by genealogy societies? How should societies promote these? Josh: Working on a smartphone app that will beep if you are close to a different society in a new location. It was good to see a session which focused on online-offline research and the role of societies in today’s genealogy. Thanks to Jill, the panel and the audience for your contributions. This is my final post on Congress and so the end of my role as an official blogger. It was a successful conference with lots of food for thought. Time to collect my thoughts, have a breather and focus on hearth and home for a while. This entry was posted in Congress 2015 and tagged Congress 2015, societies panel by cassmob. Bookmark the permalink. Pauleen I wasn’t able to make it to the session, but it’s great to read the questions and responses given. So thank you for posting this. You’re welcome Alona..I can’t quite believe how little time we each had to catch up with each other…time just flew. Thank you so much for your posts and reflections. I do prefer the term family history as surely that is what most of us initially set out to find. The local group I have just recently joined has a small web presence but no social media. http://www.genealogy-noosa.org.au/ For very small groups run entirely by volunteers, it is probably still too early to expect a social media presence. At this stage many small groups do well to list some sort of catalogue online to let prospective researchers know of their existence and resources. Congratulations on all the posts you’ve done as official blogger. Most appreciated. Thanks Carmel. I think the whole trade-off between volunteer time and activities is a never-ending challenge….a definite case of choosing “horses for courses”. Glad the various posts from the official bloggers were helpful. You captured the session well Pauleen, a great summary for me thank you. In talking to friends and work colleagues about my time in Canberra I found I deliberately used ‘family history’ more when describing what I had been doing, rather than ‘genealogy’ because people generally seem to understand what you are talking about…and don’t give you a blank look. That comes later if you talk too long about one of your ancestors! I think in most cases you only have time for the ‘elevator pitch’ and within that short time you need to use words that people are familiar with, ie, family history and not genealogy. Seems like more and more of us are thinking the same way but it would take some major effort to change organisations and branding. besides which I think the story part is what has the best chance of hooking people. Don’t know about you but I really dislike the “how far back have you gone?” question. Thanks Pauleen for the summary. I had to leave early and was sorry to miss it. Nice to see that National Family History Month got a plug, both by Jill and you! It was also interesting to hear the responses from overseas speakers.